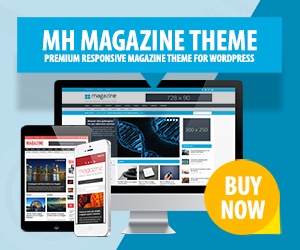 The MH Category Columns widget which is included in MH Magazine has been designed to display up to 5 columns in a row with posts from specific categories. To display content through this widget, you have to enter the IDs of your preferred categories and select the number of columns you would like to show. The MH Category Columns widget is best to be used in full-width or 2/3 width widget areas and looks nice when presenting your content in an appealing and well-organized way. In this article including video tutorial we will show you how to use the MH Category Columns widget properly. You’ll learn how to display categories the correct way or select the number of columns for the MH Category Columns widget. In addition we’ll also show you a couple of example layouts which you could replicate if you like to show your content nicely on your website. First you may enter a widget title to display a heading for this widget (optional). In addition, if you like to link the widget title to a certain URL, you can enter the URL just below. To filter and select your preferred categories, you simply need to enter the category IDs accordingly into the particular field. In case you don’t know how to find the category ID, please see this tutorial: How to find the WordPress category ID. You can enter multiple category IDs, separated by commas (e.g. 2,5,9). Within the widget options you can specify how many columns you would like to display by selecting the Number of Columns. The same applies to the post count option where you can enter the number of posts you would like your widget to display within each column of the widget. To skip posts from the query, you can enter a number in the Skip Posts field. For example if you enter 3, the first 3 posts in the query will be skipped. The MH Category Columns widget also allows to order posts based on different criterias by making use of the Post Order option. The image size of the thumbnails within each column of the widget should be considered based on the number of columns you want to display and based on the widget area where you want to place the MH Category Columns widget into. It is recommended to put the widget into a full-width or 2/3 width widget area. If you want to display two columns within a full-width widget area, please select Large as image size. Otherwise you can stick to the Normal image size. If you like, you can choose to display the category name for each column within the widget. By default, the MH Category Columns widget is set to display the category name out of the box. In case you would like to hide the category name, simply un-check the box for the Display Category option. To show you what is possible with the MH Category Columns widget and help you make yourself familiar with the particular options within the widget, we have created a video sequence where you can see some example layouts which you can easily replicate by making use of the widget options to display content on your website nicely and well-organized.